Source: Reproduced with permission from Valero Energy Corporation. Refineries vary by complexity; more complex refineries have more secondary conversion capability, meaning they can produce different types of petroleum products. 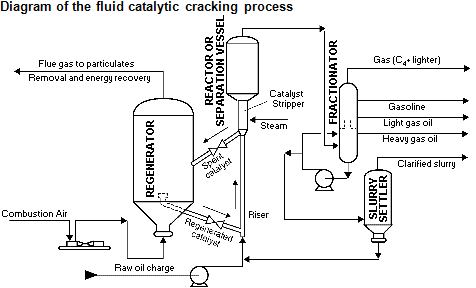 Fluid catalytic cracking (FCC), a type of secondary unit operation, is primarily used in producing additional gasoline in the refining process. Unlike atmospheric distillation and vacuum distillation, which are physical separation processes, fluid catalytic cracking is a chemical process that uses a catalyst to create new, smaller molecules from larger molecules to make gasoline and distillate fuels. The catalyst is a solid sand-like material that is made fluid by the hot vapor and liquid fed into the FCC (much as water makes sand into quicksand). 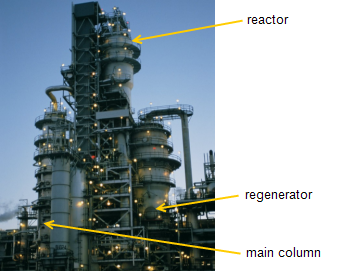 Because the catalyst is fluid, it can circulate around the FCC, moving between reactor and regenerator vessels (see photo). The FCC uses the catalyst and heat to break apart the large molecules of gas oil into the smaller molecules that make up gasoline, distillate, and other higher-value products like butane and propane. After the gas oil is cracked through contact with the catalyst, the resulting effluent is processed in fractionators, which separate the effluent based on various boiling points into several intermediate products, including butane and lighter hydrocarbons, gasoline, light gas oil, heavy gas oil, and clarified slurry oil. The butane and lighter hydrocarbons are processed further to separate them into fuel gas (mostly methane and ethane), propane, propylene, butane, and butene for sale, or for further processing or use. The FCC gasoline must be desulfurized and reformed before it can be blended into finished gasoline; the light gas oil is desulfurized before blending into finished heating oil or diesel; and the heavy gas oil is further cracked in either a hydrocracker (using hydrogen and a catalyst) or a coker. The slurry oil can be blended with residual fuel oil or further processed in the coker. Carbon is deposited on the catalyst during the cracking process. This carbon, known as catalyst coke, adheres to the catalyst, reducing its ability to crack the oil. The coke on the spent catalyst is burned off, which reheats the catalyst to add heat to the FCC process. Regeneration produces a flue gas that passes through environmental control equipment and then is discharged into the atmosphere. Source: U.S. Energy Information Administration, modified from OSHA technical manual.